See Gaillardia pulchella Foug. for a general description of the species. The variety picta has larger flower heads in different shades and the plant is taller. [RHSD, Hortus]. Picta was figured in Curtis's Botanical Magazine as Gaillardia bicolor var. 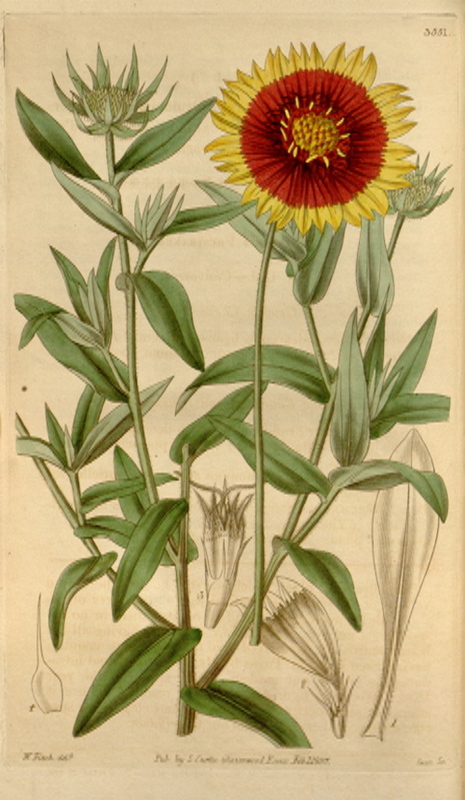 drummondii [BM t.3368/1834], the flower red petals edged with yellow, and as Gaillardia bicolor var. drummondii integerima. ‘This beautiful plant, which we still hold to be only a variety of G. bicolor, is identical with the G. picta of the "British Flower-Garden," and in reality differs in no respect from our var. Drummondii, except in having all the leaves entire. It is derived too from the same country, having been found in Texas by Mr. Drummond, and introduced by him to our gardens, in the spring of the year 1835. [BM t.3551/1834]. In an article on annuals by J. H. Beckman, the Gardeners Chronicle described G. picta: ‘This is a splendid thing, with star-shaped flowers of a purple colour with yellow edge; it grows about a foot in height, with slender stems. A good plant either for beds or patches. It is a native of Louisiana.’ [Gard. Chron. 1855]. Johnson's Dictionary agrees with the Louisiana origin and gives a date of introduction of 1833. It is also figured in the Floricultural Cabinet [FC p.25/1835], and the variety tricolor in Flore des Serres [FS f.643/1851]. The ground colour of the petals is white, the centre red and the edges of the petals yellow. The Gardeners Chronicle records Gaillardia picta coccinea nana, an herbaceous plant, growing to 45cm, with numerous golden-yellow chrysanthemum-like flowers, with a brown-crimson centre, each flower to 7.5cm in diameter, expanding towards the evening. It flowers in summer and autumn. ‘Very picturesque and suited for small groups or beds.’ [Gard. Chron. 1849]. BFG t.267/1834. Listed in the 1850 and 1857 catalogues [H.106/1850]. Gaillardia pulchella Foug. var. picta (D.Don) Voss | BM t.3551/1834 | BHL. Figured as as Gaillardia bicolor var. drummondii integerima.